The S&P 500 is now essentially flat over the past two years. The market has seen three 10% drawdowns in a little over a year, after not having had an official correction in the prior two years. Where does this leave the markets in context of the post-recession bull market? And, given recent recession concerns, how does the market compare to other recessionary bear markets, and if we do go into recession, what can we expect? The chart below shows the S&P 500 since 2010. Significant corrections are shaded in light grey and are measured from the recent high to the low. The reason that all price action in the index since May of 2015 is considered a single correction (rather than two separate) is because the index failed to make new highs in October. It came close, but the market was unable to breach it’s May high of 2,134. Because the S&P 500 failed to reach new highs after a significant sell-off, the current correction has already differentiated itself from the previous five. Its duration is almost three times longer than the next longest—the 2011 sell-off ignited by the U.S. credit downgrade and European Sovereign Debt Crisis. In terms of acuteness the top-to-bottom drawdown of 15.2% is comparable to post-Recession corrections, which have averaged losses of 13.6%. If February 11th marked the low, we can expect, based on past corrections, an average of 79 days to recover to new highs. 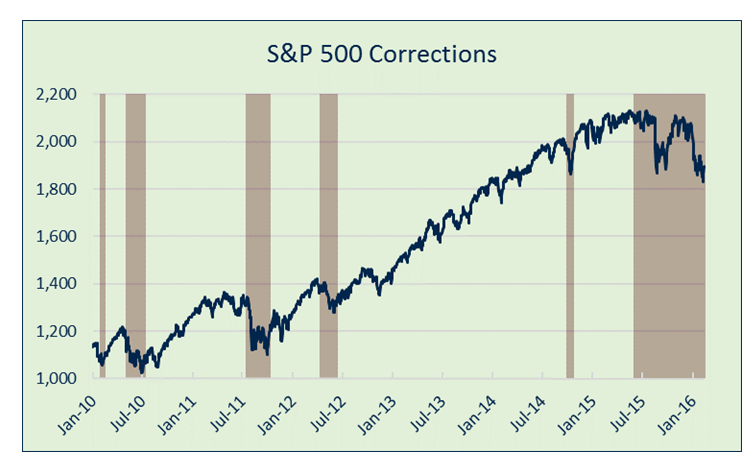 The most severe correction in 2011 took 135 days to recover to new highs. In any case, if indeed the lows are in, investors can hope to find the S&P 500 trading at new highs somewhere between the beginning of May and the end of June. Of course, there is no guarantee that this correction will follow the recent law of averages, especially since it is already more mature than its former brethren. Also, a test of the 2,134 level in early Summer, when seasonality is providing market headwinds, might be a difficult proposition. After all, the “Sell in May” strategy of investing has worked well over the last five years. Nevertheless, it is said that while history never repeats, it often rhymes, so, at the very least, it is a good exercise to consider possible recovery timelines. Below is a chart illustrating the current market correction in comparison to other post-Recession sell-offs. Since the current corrective action has lasted so much longer than the post-Recession prototype, it is also a beneficial exercise to compare market internals to determine if this is indeed a correction, or something more pernicious. The two charts above explore the relative strength of the major sectors during the post-Recession corrections. The first chart illustrates the absolute performance of the S&P 500 and all of its sub-industries during each correction. The second chart, plots the relative performance of the sub-industries to the overall Index. This allows for comparison across between corrections since every correction has a unique drawdown level. So, for example, financials were down 19.5% during the most recent correction (chart 1) versus the overall S&P 500 which was down 15.2% (chart 1). As a result, the financials have underperformed by 4.3% (chart 2). In the five corrections prior, financials underperformed the overall index by an average of .9% (chart 2). So, relative to these previous time-periods, financials, are underperforming the S&P 500 by 3.5% more (chart 2) than we might expect given historical precedent. Looking at the relative industry performance between corrections can provide a bit more insight regarding their similarities and differences. It makes sense, given the price action in WTI over the past seven months, that there was been additional underperformance in energy and basic materials (-11.8% and -5.5% respectively). Furthermore, there are no glaring differences in financials, consumer discretionary and industrials. And telecom outperformance can be explained by lower government yields in this environment versus prior corrections. Also, in all six corrections, telecom outperforms the broad market, as it often does in “risk-off” environments. However, the three industries I want to pay close attention to are health care, consumer staples, and utilities. All three of these industries are considered defensive, and often, just prior to and during recessions, they exhibit extreme outperformance as money managers rebalance portfolios. If the most recent correction is more than that, perhaps the beginning of a recessionary bear market, then it would make sense that these industries would exhibit higher relative returns. It seems that some of this is occurring. Utilities have outperformed the broad index by 10% more than would be expected based on prior correction averages. Consumer Staples have outperformed by 8% more, while health care has underperformed (or outperformed by less) by 4.6%. So while it is not entirely definitive, it seems that we are seeing some pretty sizeable sector rotation that could potentially signal that this drawdown is inherently different than previous post-Recession corrections—and potentially the beginning of a recessionary bear market. Although every market has its unique personality and no two markets are the same, generally, after a 15% drawdown, the future market path is quite binary. If the economy does not go into recession, typically markets rebound and test their highs. If, however, the economy goes into recession, the correction morphs into something much more severe. The chart below maps out the path of the last four recessionary bear markets. On average, the market low is achieved 507 days after the market top, and in one instance (2000), it took 921 days to complete the sell-off. So, if we are indeed entering a bear market, we can expect to see cycle lows about 8 months and 22.5% lower from now. Perhaps even more daunting is the fact that after we hit that low, it will take another 856 days (2.3 years) to take out the high-watermark of 2,134 on the S&P 500. This means, that around Valentine’s Day 2019, we will be back at the level seen last May. Sobering, for sure. But let’s not put the nail in the coffin of this market quite yet. The correction thus far does not fit the typical pattern in the sense that it has been longer in duration, and there seems to have been more defensive sector rotation. While worrisome, if this is the beginning of a recessionary bear market, performance should be somewhat similar to previous bear markets 271 days into their drawdown (the current correction). The chart below tracks the performance of each bear market on day 271. At first glance, it seems that the current market action is right on pace with previous bear markets. The S&P 500 was down 11.2% as of 2.16.2016. The average bear market was down the same amount in a similar time frame. However, the 1990 recessionary bear market was a shallow one, and by day 271, it had already achieved its low and rallied to new highs. If you take this time period out of the analysis, the average bear market would be down 15.9%, and the current drawdown would look weak in comparison. More importantly, the market internals of this current market are much different than that of previous recessions. The charts below track the sub-industry absolute and relative performance of the current market, and the bear markets beginning in 2000 and 2007. I threw out the 1990 data because the bear market was so short in duration, and shallow in terms of drawdown. If in fact, we go into recession, and the market performs like it did in 1990, there is very little downside left. The 1981 data is not included because I couldn’t find it. I know, not as scientific as I would like, but I am not trying to win an econometric model competition here, I am just trying to provide context. In terms of what this market looks like internally to the past two recessionary bear markets (at a similar juncture—271 days in), there are both similarities and differences. Perhaps the most glaring similarity is the fact that one sector in each environment has led the market lower. In 2000, it was technology. In 2008, it was financials. And today, it is energy. The tech bubble and real estate/financial bubble are easy to pinpoint in hindsight, and it was the deflating of those bubbles that caused such an acute downturn in the economy and the markets. The energy sector has a similar feel today. Low interest rates and lofty expectations for global growth caused overly-leveraged companies to ramp up production and capex to benefit from energy prices that would surely keep rising. Oversupply has a nasty way of self-correcting, as we are currently witnessing, and I don’t think there are many that would dispute we were in an energy bubble. The pertinent question now is: “Is the energy sector big enough to push the broad market index into bear market territory, and can it push the U.S. economy into recession.” Those who have followed my posts, know that I do NOT think this will happen. Oil & gas extraction jobs account for a mere 1.3% of total employment, and all mining is only 5.4%. Contrast this with the fact that the service sector (including the government) of the U.S. economy accounts for 86% of all employment. It’s also worthwhile to point out that the technology accounted for 35% of the S&P 500 at the top of the market in 2000. Financials accounted for 20% of the S&P at the top in 2007. And energy, only accounted for 8% of the broad market at our most recent highs. Still, I have to acknowledge that the energy bubble did exist, and like previous recessionary bear markets it is leading the broad indices lower, just like technology did in 2000, and financials did in 2008. Leadership is where the similarities stop. Recall that one of the concerns regarding the current sell-off, is that there seems to be more defensive rotation than in prior corrections. This may be true, but that rotation is negligible compared to the last two bear markets. Relative performance of health care has lagged the average relative performance in the last two bear markets by 33.7%. Consumer Staples have lagged by 23.6%, and Utilities, 23.7%. Moreover, the S&P 500 is down only 9.6% from its highs, whereas the previous two bear markets were already down an average of 16.6% by this time. The lengthy correction that has stricken the broad market since May of 2015 is unique relative to the short corrections that we have experienced post-Recession. Not only has it been longer, but there is more evidence of defensive sector rotation amongst money managers. However, just because it looks and feels different, does not mean that it will inevitably morph into a recessionary bear market that will bring steep equity losses and push out recovery periods by years. In fact, the current market correction shows little resemblance to the bear markets of 2000 and 2008 at similar points in time. Their drawdowns were much steeper at this point, and the defensive sector rotation was much more apparent. I am in the camp that the lows are in for 2016, and at some point this year we will be talking about new all-time highs on the S&P 500. But, then again, I’m a bond guy–so take it with a grain of salt.